DALLAS — Five semifinalists for the Outland Trophy were named on Wednesday night by the Football Writers Association of America and were featured during a reception in Omaha, Neb., where the trophy presentation banquet for the 71st Outland Trophy winner will be held in January. The five semifinalists — all offensive linemen — in alphabetical order, are: Pat Elflein, Ohio State; Cody O’Connell, Washington State; Ethan Pocic, LSU; Cam Robinson, Alabama, and Connor Williams, Texas. Elflein is a 6-3, 300-pound senior, who previously played guard, but is a center this season for the nation’s second-ranked team. O’Connell is a behemoth 6-8, 351-pound junior guard who helps trigger Washington State’s high-octane offense which ranks second in the country in passing with quarterback Luke Falk. Pocic, a 6-7, 302-pound senior center, anchors the line for LSU’s potent rushing game, which is led by Leonard Fournette and Derrius Guice. Robinson, a 6-foot-6, 310-pound junior, is the top offensive tackle on the No. 1-ranked team in college football that produces 492.2 offensive yards a game. Williams, a 6-6, 288-pound sophomore tackle at Texas, blocks for the leading rusher in the FBS in yards per game, D’Onta Foreman. The five semifinalists will be whittled down to three finalists and announced on Tuesday during The Home Depot College Football Awards Nomination Special, starting at 3 p.m. (Eastern Time) on ESPNU. The winner of the 2016 Outland Trophy, will be announced Dec. 8 on The Home Depot College Football Awards on ESPN, the main show beginning at 7 p.m. (Eastern Time) from the National Football Foundation’s College Football Hall of Fame in Atlanta. For the 20th consecutive year, the presentation of the Outland Trophy will occur in Omaha, on Jan. 11, 2017 at a banquet sponsored by the Greater Omaha Sports Committee. At the same banquet, Oklahoma offensive lineman Greg Roberts, will receive an Outland Trophy. Roberts was the 1978 winner of the award before trophies were handed out by the FWAA. His Oklahoma coach, the legendary Barry Switzer, will receive the third annual Tom Osborne Legacy Award during the evening. 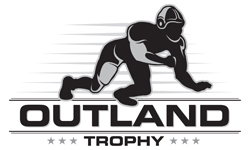 The Outland Trophy is a member of the National College Football Awards Association (NCFAA). The NCFAA encompasses the most prestigious awards in college football. The 22 awards boast about 700 years of tradition-selection excellence. The Football Writers Association of America, a non-profit organization founded in 1941, consists of more than 1,300 men and women who cover college football. The membership includes journalists, broadcasters and publicists, as well as key executives in all the areas that involve the game. The FWAA works to govern areas that include game-day operations, major awards and its annual All-America team. For more information about the FWAA and its award programs, contact Steve Richardson at tiger@fwaa.com or call 214-870-6516. The Greater Omaha Sports Committee, founded in 1977, is a 501(c)3 non-profit organization, consisting of more than 900 men and women from the City of Omaha, the State of Nebraska and others. The membership serves to communicate, develop, initiate and promote sports activities in the Greater Omaha sports area. In addition to the Outland Trophy Award Dinner, the Greater Omaha Sports Committee promotes high school, college, and professional sports in the Greater Omaha area and the Midwest.